Relax in the knowledge that you’ll be with the only NZ operator that guarantees you will not get seasick. Two Islands in one amazing day – Blumine Island and Motuara Island Wildlife Sanctuary. Our passionate expert guides will be with you on the boat and on Motuara Island – our team are passionate about the local environment and love to share its unique aspects with our small groups. We will drop you off on Blumine Island at approximately 9am, (this part of the tour is unguided). For bird enthusiasts keen on seeking the rare and endangered Orange-fronted Kakariki, you have a 90% success rate of finding this elusive bird, bird watchers from all over the world come here to photograph and view these amazing creatures. Note there is no jetty or pier onto the island, so you may end up with wet feet getting on and off the vessel! As you have five and half hours on Blumine you will also have time to look for South Island Saddleback, Bellbirds, Kereru, Tomtits, Tui, Weka, and the very rare Mohua. 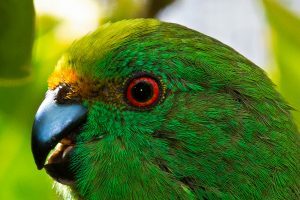 We will pick you up at approximately 2.30pm and take you up to Motuara Island, a predator-free, premier wildlife sanctuary which is home to some rare species such as the yellow-crowned parakeet and Saddleback. Our comfortable vessels and expert team take you on a conservation-focused, wildlife adventure for your soul. Expert commentary and fantastic viewing areas allow you to enjoy playful Hector’s, Bottlenose, or Dusky Dolphins (90% encounter rate!). Explore the island on your own or go with our knowledgeable guide who will point out and describe the resident blue penguins, rare saddleback, melodic bellbirds, cheeky robins, native pigeons and yellow-crowned parakeets (kakariki). If it’s a clear day, you may also be able to spot the North Island in the distance. We are located conveniently on Picton’s main waterfront with car parking close by and only a 1-minute walk from the main street. Just look for the Dusky Dolphin outside our shop. Before your tour starts feel free to take a seat inside the shop or outside on our sun drenched deck and enjoy the stunning views. Customers can also get online with our free WiFi, and purchase a tea or coffee to enjoy on the deck. Our tour schedules are integrated with the Interislander – so there is no chance that you’ll miss your ferry. We pride ourselves on being a truly sustainable operator in the Marlborough Sounds. E-Ko Tours was founded on our passion for the environment and conservation. Learn more here. New Zealand, just a few minutes walk from the ferry terminal.